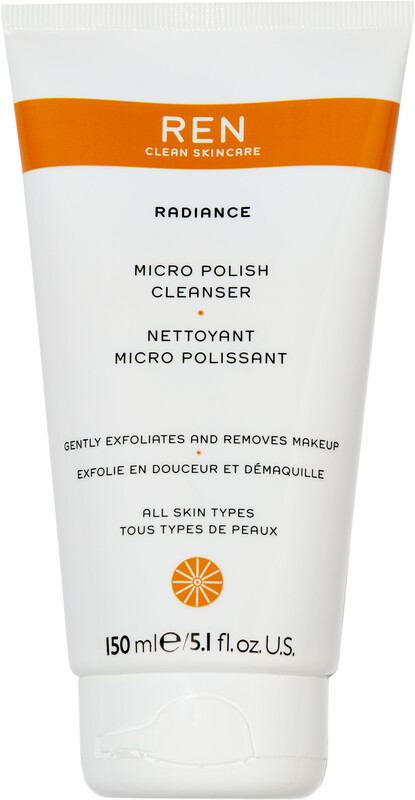 Deeply cleanse and renew your skin with the REN Micro Polish Cleanser, a radiance-enhancing exfoliator for all skin types. Created with amber powder microbeads, this 2-in-1 skin cleanser helps to encourage collagen synthesis whilst smoothing out the skin. The gentle buffing action effectively removes dead skin cells, leaving the complexion looking purified and more energised. A selection of fruit acids help to exfoliate and decongest to reveal a brighter looking complexion, including glycolic acids from pineapple, lactic acid from passion fruit, plus papaya extract, which helps to retain moisture. Use 2-3 times a week. Massage onto damp skin in circular motions, and then rinse thoroughly with warm water. REN Micro Polish Cleanser 150ml is rated 5.0 out of 5 by 1. Rated 5 out of 5 by Anonymous from Very effective Brilliant exfoliator - not too course but very effective. It kind of encourages all of the nasty stuff out of my skin in not too harsh a manner.